A few days ago I wrote about how my wife doesn’t cry very much, but when she does it’s often over the oddest things. Today was one of those odd times. This time it happened while Tammy was watching our Fantasy Football stats update on her laptop as we were watching the Panthers-Bears game. She was thinking about adding a running back from the Redskins who was having a big day but wasn’t sure who she should drop from her current roster. 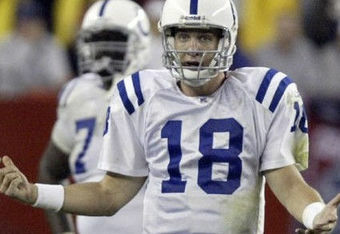 Me: There’s NO REASON you should have Peyton Manning on your roster. Tammy: I know, but I’m saving him for when I need to pick up a quarterback. Me: You have other players on your team you could drop that I can almost guarantee you no one else will pick up. What came next had me chuckling and shaking my head. Tammy started talking to the computer as if Peyton himself were sitting directly in front of her. Tammy: I’m sorry Peyton. I hate to do this. Oh man, I think I’m gonna cry. Me: I’m not surprised. I know how difficult this is for you. Tammy: I’m seriously crying right now. She turned to show me the tears in her eyes and I turned to the computer. Tammy: You’re a terrible liar. Gallery | This entry was posted in Daily Life and tagged daily life, Fantasy Football, humor, sports. Bookmark the permalink. I can pretty much guarantee that I will never cry over football. Unless my daughter decides to marry a football player. Or gets knocked into a coma by a football. Or loses a spelling bee by spelling football wrong. Tammy was crying more over having to remove her favorite man in the world (yes, that includes me) from her team. Hah! Too funny…but Peyton screwed my team so I would not be crying to drop his injured a**. 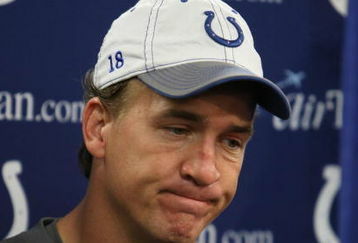 I drafted Dallas Clark…big mistake on my part. I went into some of my wife’s Manning Mania in the link below. She got mad at me for putting it in there because “it wasn’t needed.” I told her it was necessary to show people how crazy you are. She makes sure the everyone knows “well he does have twins now” when the whole neck issue came up. Her team name this year is “Loving the Mannthings.” See? She’s nuts. I’m OK with knowing I’d be “dead to her” if Peyton batted his eyes at her. The real kick in the balls is that I’m 0-4 against her in Fantasy Football in the joint co-workers league we’re in.